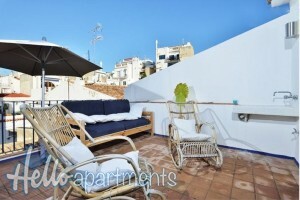 6 bedrooms, 5 bathrooms, sun terras, walk to beach, shops, bars and restaurants. This unique property dating back to 1640 is just 75 meters from the beach and situated in the beautiful center of Sitges. The street is quiet, but very close to shops, restaurants and bars. The beach is a sandy beach of the family. The interior of the house has been completely renovated in early 2013. We have air conditioning throughout the house. The house has 6 bedrooms of which 3 have en suite bathrooms. In total there are 4 bathrooms and 2 toilets. We have 2 kitchens one on the top floor with a beautiful sun terras and one downstairs. We have a long table inside and outside so everyone can eat together. We also have an elevator in the house so for the elderly, it is perfect too. Please select a number of nights greater than 7.